I think it says a lot about a dungeon when you don't even bother to name the thing. You see, when you give a dungeon a nifty name, like "Undercrypts of the God-whore," or "Deepest Deeps of the Lord of the Deep," you're already at the very least implying that there's a story of which the dungeon is a larger part. This may not even be true, but the implication is there. On the other hand, when the dungeon has no name, you're declaring: I have no preconceptions about this dungeon and how it will fit into my campaign. There's no over-arching storyline here, no Big Bad that somehow fits into the campaign in a meaningful way, no artifact specifically intended to end up in the players' greasy little hands. No, a nameless dungeon generally says one thing, and one thing only: this place is full of monsters, and its sole purpose for existing is for you (the players) to pillage and loot the place - or die trying. And there is - in my opinion - absolutely nothing wrong with that sort of declaration. Of course, this is just so much blather. 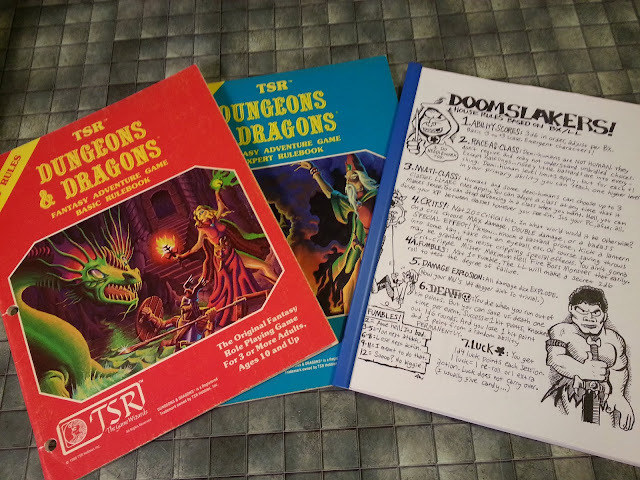 It's really nothing more than my attempt at an interesting introduction for the latest dungeon from my scanning project: Yet Another Nameless Dungeon. Just wanted you to know that I am using your recently posted mountain dungeon as the undercity of one of my locations. The party has just broken through from the new sewer itno the old complex, very near the surface tunnel, and the Troll room. Since I wasn't using any accompanying text apart from room labels, I had six ghouls overseeing the Troll in the room beyond 'his', and the combination about destroyed the party. They understand it will be a slog through the complex, and they are bringing 20 hireling men-at-arms and specialists in the hopes that'll soften the impact. This one has been saved, and awaits further adventures. Great stuff, Chris. 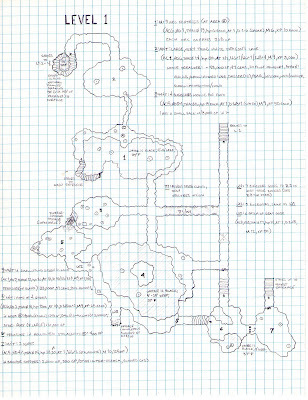 This one in particular looks nearly identical to many of my own dungeons from the early days, right down to the paper and all caps handwriting. I truly enjoy seeing this stuff, and you should be grateful that you have kept so much of your old handiwork organized. Not too many of us can say that after 25-30 years. @Timeshadows: That's very cool. :D I think it's great that the party's taking a small expedition of hirelings and men-at-arms along with them into the dungeon. I'd love to hear how they fare. I would so love to visit the Undercrypts of the God-Whore. 1)Bring lots of cash - it's expensive. 2)What happens in the Undercrypts stays in the Undercrypts.